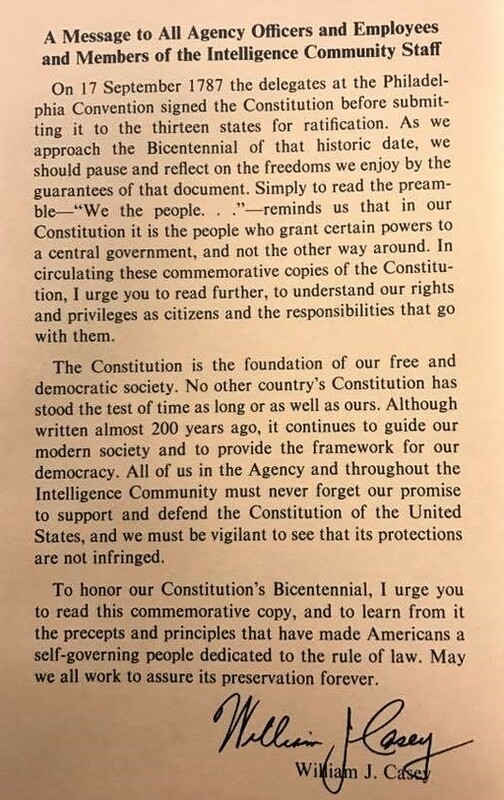 I’ll confess, I didn’t fully understand what it meant to take that oath until I read William Casey’s powerful introduction on the copy distributed to the employees of our Agency. In 1987, Ren and I had been friends for just 2 years. Tom and I wouldn’t meet for another 10. In those early years of our careers William Casey seemed impossibly old. In fact, he would die later that year at age 74, shortly after resigning for health reasons. But we were young, optimistic, full of ideals and energy, and certain that the new technologies we were working with would change the world. Certain that we could make the world a better place. Those technologies did change the world. They are still changing the world. They enable people to connect, and communicate, and access information at a speed and rate that is unprecedented. And although I am still waiting for flying cars, I can talk to my daughter, who is nearly half a world away, and see her face while I’m doing it. All while secure in the knowledge that I have the freedom to do these things. But to fight for freedom is to extend the ideals of our Constitution beyond our borders to those who do not have our freedoms. To stand firmly on the ideals it represents, in particular the first 10 amendments, is to remind ourselves that it is “We the people” who grant certain powers to a central government and that no government may strip from us our rights as citizens and lawful residents of this country. William Casey understood this when he wrote that we “must never forget our promise to support and defend the Constitution of the United States, and we must be vigilant to see that its protections are not infringed.” Casey understood that vigilance had to stand, even in the face of fear. It was, and is, the very epitome of what it means to serve the American people. Today, and always, Excel Technologies stands by this promise.